Among those arrested was Gladys Vega of Chelsea Collaborative. Nineteen advocates for immigrants were arrested Thursday after blocking the entrance to the Suffolk County House of Correction in a dramatic call for a halt to deportations. Advocates have held vigils at the Boston jail for years, but on Thursday, men and women knelt in front of the jail’s main entrance, locked arms, and refused to budge despite officers’ orders to move. More than 150 other protesters from Vermont, Connecticut, and across Massachusetts marched nearby, carrying signs and chanting, “Shut down ICE,” and “Shame on Suffolk County,” which puts immigrants held for civil immigration violations in the same complex as criminals. The protest is part of a national campaign to pressure President Obama to use his executive authority to curb deportations. The event was held during Holy Week as a backdrop for the advocates’ call for a compassionate response to the nearly 12 million immigrants here illegally, including about 160,000 in Massachusetts. One protester held a sign calling Obama the “deporter in chief,” for presiding over roughly 2 million deportations since he took office, even as he fights for a path to citizenship for immigrants here illegally. Police arrested 19 activists who blocked the entrance to the Suffolk County House of Correction to protest the deportation of immigrants charged with minor offenses. 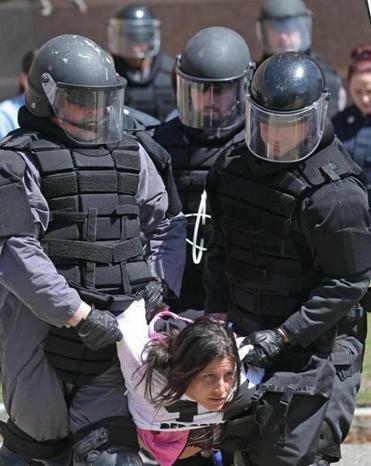 Besides Vega, among those arrested Thursday were Maria Peniche, a college student from Mexico who grew up in Revere; Andres del Castillo, the American son of a Colombian immigrant who was raised in Winthrop; and Peter Knowlton, a labor leader in Massachusetts. A spokesman for Suffolk County Sheriff Steven Tompkins said police arrested the protesters on charges of disorderly conduct and trespassing. Immigration and Customs Enforcement said the agency is carrying out its duties. “While we continue to work with Congress to enact common-sense immigration reform, ICE remains committed to sensible, effective immigration enforcement that focuses on its priorities, including convicted criminals and other public safety threats,” spokesman Daniel Modricker said. Groups that favor tougher immigration laws say the rising deportations reflect a small percentage of those who are here illegally. Last year’s federal records show that most deportees were recent border crossers or criminals, both among ICE’s top priorities. “It’s unrealistic to expect that enforcement can be scaled back much more than it already has been,” said Jessica Vaughan, director of policy studies for the Center for Immigration Studies, a Washington think tank. Peniche, 23, came to the United States from Mexico when she was 10, brought illegally across the border by her parents. They raised Peniche and her brother in Revere, but despite getting good grades, Peniche was ineligible for college financial aid. In 2012, the family returned to Mexico. A few days after they left, President Obama granted temporary legal residency to students such as Peniche. The family later returned to the United States, and they are seeking asylum. 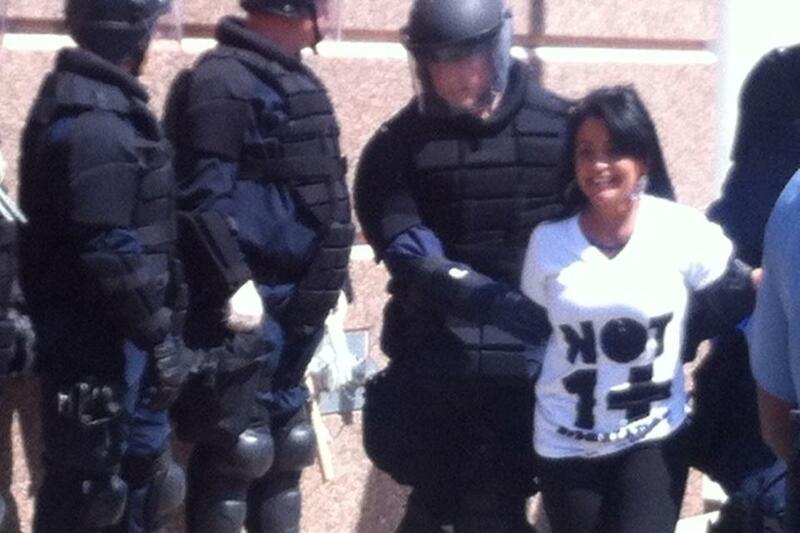 Since then, both Peniche and her parents have been detained after separate acts of civil disobedience.